Why wouldn't you make the Clear As Day Vinyl Lunch Bag? In all honestly, whether you make this DIY lunch tote for a grade-schooler or an adult, it's incredibly helpful. Not only can you save a boatload of cash by substituting disposable paper bags with this one, you can easily control messy spills thanks to the vinyl body of this bag. Including colorful binding for extra strength and a useful handle, this DIY tote has it all. Clearly, you need to make this bag. For more DIY lunch bags, check out How to Make a Lunch Bag: 14 Reusable Totes, Sacks, and Snack Bags. Wow, what an inventive and practical idea! I have not seen this type of bag done as a sewing project before and I love the usefulness of it in that you can give it a good cleaning yet it will still look great! 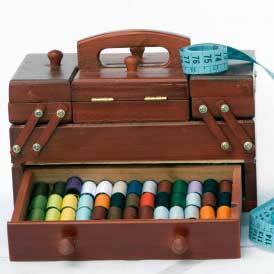 And I could also see using this in the craft or art room to store supplies which you can readily see what is in there! A great project that anyone would love to,own! Thanks for sharing!